On February 11, 1793, Carl Friedrich Kielmeyer delivered a talk, titled, “On the Relations of the Organic Forces to One Another in the Series of Different Organizations, the Laws and Consequences of these Relations.” While the talk’s contribution to the science of life cannot be overstated, it almost never made it beyond its initial audience. 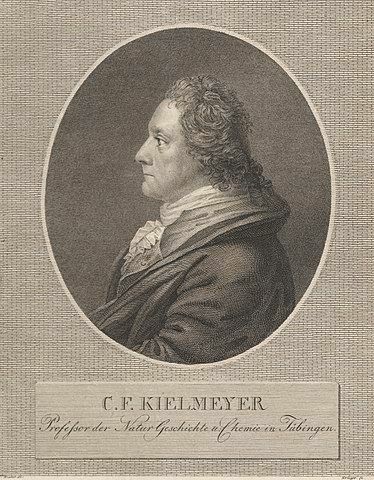 Kielmeyer was generally reluctant to publish, and it was only because of a pushy student, a bottle of wine, and some cake that Kielmeyer published his talk, which was enthusiastically received by philosophers and naturalists. But Kielmeyer’s concept of nature did not emerge de novo. It developed out of the ideas of 18th-century life science. The philosopher Friedrich Schelling was likely the first to recognize (at least in writing) a key provenance for Kielmeyer’s approach. The major idea of Kielmeyer’s work, Schelling writes, “is taken from [Johann Gottfried] Herder’s Ideas for the Philosophy of the History of Humanity, first part”. I agree with Schelling that Kielmeyer’s concept of nature stems from Herder’s arguments in his Ideas, which I’ll illustrate shortly. At the same time, a difference does exist between Kielmeyer’s and Herder’s investigations of nature. While they both use the relation between constitutive organic forces to provide explanations of the organic world, Herder remains dependent on theological commitments and anthropocentric principles. This reliance doesn’t hold for Kielmeyer, however. In conclusion, I will consider what difference, if any, this makes for Herder’s and Kielmeyer’s study of nature. "A Series of Interconnected Events: Kielmeyer's Organic Laws of Nature" was presented at the 2018 Association for Eighteenth-Century Studies Annual Meeting on March 22, 2018 in Orlando, FL.